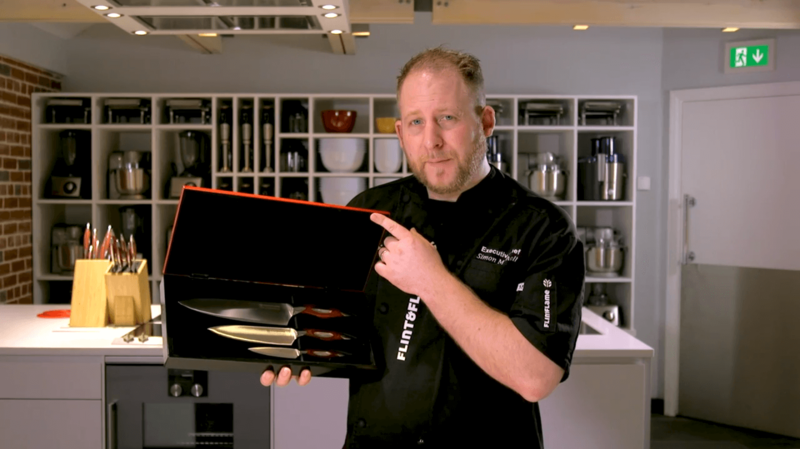 This time in our Knife Focus series, we’ll be taking a closer look at one of our best selling gift sets, the beautiful 3 Piece Chef Set. Presented in a stunning wooden case this versatile set of knives makes the ideal wedding gift, birthday present, retirement gift or simply as a special treat to yourself. Containing the 8″ Chef Knife, the 6″ Chef Knife and the 3.5″ Paring Knife, it’s the perfect set for anyone who has a love of cooking and fine craftsmanship. The 8″ Chef Knife is perfect for handling your larger fruits and vegetables, and slicing bigger pieces of meat. It has a nice sharp point for scoring things, and as a deep blade, which is ideal for crushing and for picking things up. The 6″ Chef Knife is your go-to knife for dicing and slicing meat, vegetables and virtually anything else you need it to handle. It’s curved blade means it’s easy to get that rocking motion when chopping. The 3.5” Paring Knife truly is a ‘must-have’ for every kitchen. With its nice short blade it’s perfect for peeling, taking the heads off fruit, stringing your beans and taking care of your fresh ginger. What Else Makes the 3 Piece Chef Set so Good? Order the 3 Piece Chef Set Today! If you’re looking for the perfect wedding gift this Summer, the 3 Piece Chef Set is a stunning choice in it’s beautiful wooden gift box. The three knives it includes will last a lifetime and be happy tackling all the kitchen tasks you could think of. If you’re a Flint & Flame Gold Member, you can order the Flint & Flame 3 Piece Chef Set today for the Gold Member price of just £195 (normally £325). To see your special Gold Member pricing, log-in to your account using your normal details and then visit our shop to make your purchase.